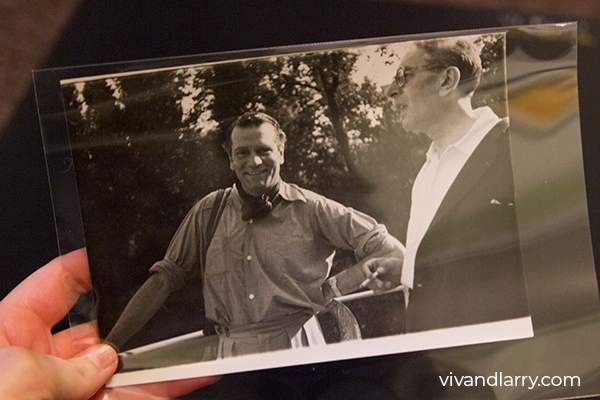 In 2017, when Sotheby’s released the catalogue for the Vivien Leigh Collection auction, there was one lot that stood out to me above all else: lot 237 – four personal photograph albums mainly depicting Vivien’s private life with Laurence Olivier. While some people went to the auction wanting anything belonging to Vivien, these albums were absolutely it for me. I ended up spending more than I had planned to (didn’t everyone? ), but #noregrets! It’s an investment and I plan make the images accessible to fellow fans. Of course this would not have been possible without the financial assistance and moral support of so many of you. I’m forever grateful for those of you who trusted me enough to donate to my acquisition and preservation fundraiser. Thank you so much. Whilst gathering donations to bid I promised that, should I be lucky enough to win, I would document the process of cataloguing and preserving the albums for the long-term. I’m not an academically trained archivist or conservator, but I am lucky enough to have worked in a photographs archive and to currently work in a museum with a large photographs collection. This is an ongoing endeavour and the advice given to me by my archivist and conservator colleagues has been invaluable. Here’s the first progress report. 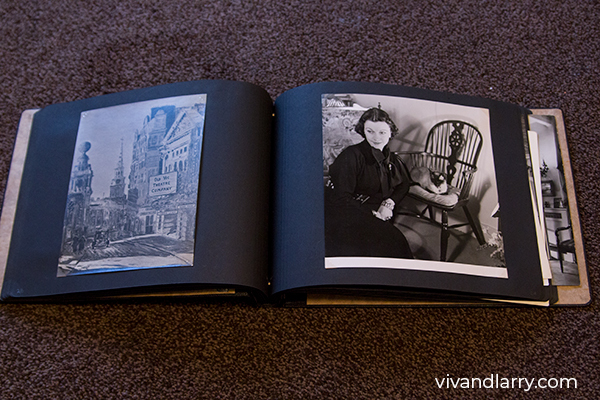 Flat lay of Vivien Leigh albums and materials used to package them. Collecting doesn’t (or shouldn’t) just end with acquiring something. Most materials won’t last forever, and paper is especially ephemeral. 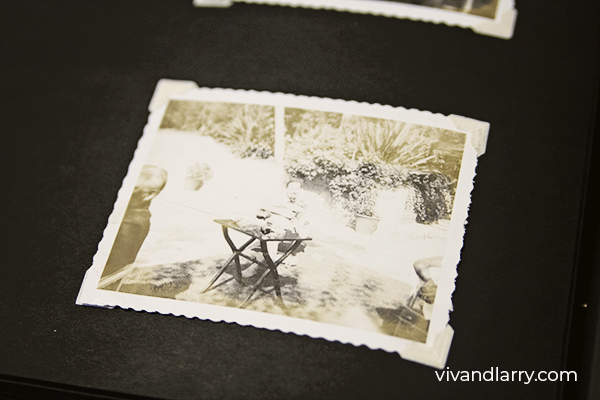 Photographs have a limited lifespan and can be damaged by exposure to light, improper environmental control, handling, folding, tearing and crinkling, chemical breakdown, and several other factors. 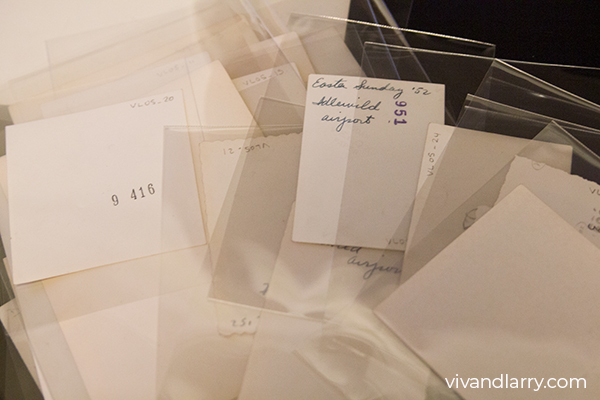 Luckily, it appears that Vivien’s albums were well taken care of by her family. These are all gelatin silver prints, which has been the common mode of printing black and white photographs since the late-19th century. A few of the snapshots have what appears to be sulfiding or some other sort of chemical degradation that has led to yellowing/fading, and a few others have slight fading along edges, but on the whole they are in pretty good condition. Snapshot of Tennessee Williams in Los Angeles, 1950. The photo shows significant yellowing and fading. I did discover a couple of issues whilst going through the albums. 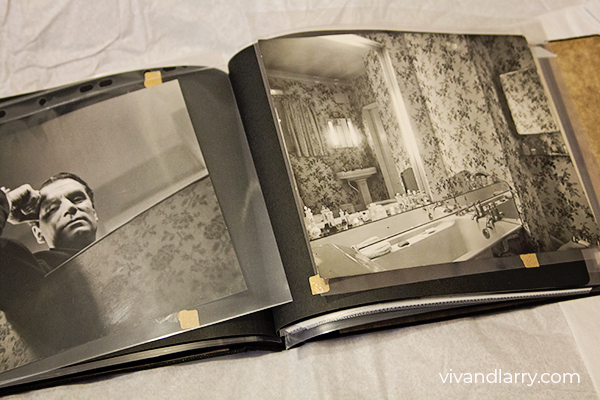 While the snapshots were placed in photo corners and can be removed fairly easily, two of the albums have images that have been glued to the pages. This has resulted in slight rippling of both the prints and the album pages. I’m hesitant to try and remove the prints with an archival spatula and so for now I’ve left them as is and have cut pieces of tissue paper (see below) to place in between each page. Rippling of album pages due to use of glue. You can see new tissue paper has been placed between pages. The album of photographs from Durham Cottage presented another problem. As several prints were loose and falling out, I opted to remove all of them and place them in sleeves. Unfortunately, several of them were also stuck down with adhesive tape that had yellowed and hardened over the years. In this case I took an Xacto knife and carefully cut the tape away from the album pages. However, remnants are still stuck to the backs of the prints. Any tips for removing it would be most appreciated. Examples of images in album VL02. They had been stuck down with tape as well as in photo corners. The image on the left shows some silver mirroring (that bluish tint on the shadows). 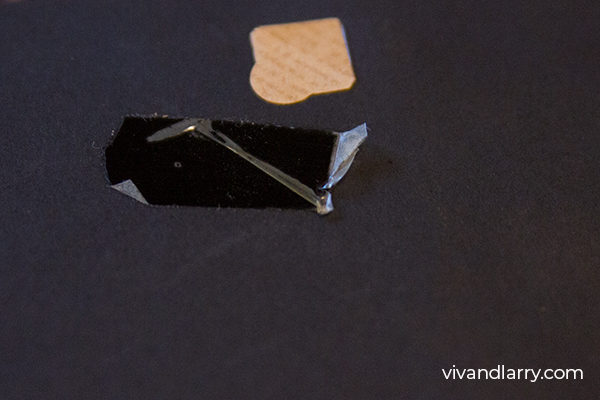 Photo corner and old sticky tape that was holding down images in album VL02. Preservation materials are not cheap, but they are worth shelling out for to help protect from further damage. Image of Laurence Olivier and William Walton in Ischia, 1953. Packaged in micron sleeve. Once the recommended supplies were on hand, packaging old photos and albums was pretty straightforward. Each loose photograph was placed in its own sleeve (I had some magazine-sized sleeves from an archive project I worked on a few years back and cut these to fit the smaller photographs). 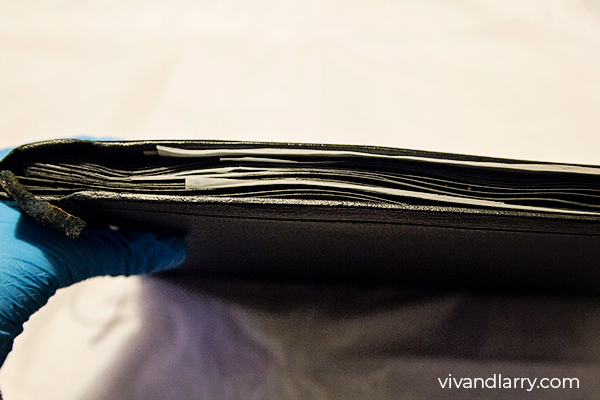 In the case of album VL03, I removed the old tissue paper that came with the album and replaced it with new sheets. I then wrapped each album in tissue paper, labelled them with pencil, and placed them in labelled folio boxes. Image of Durham Cottage in micron sleeve. 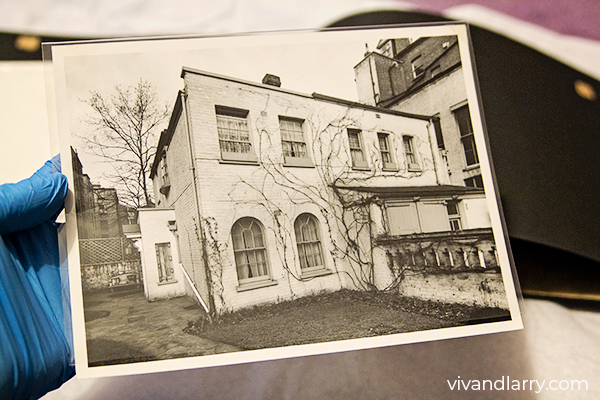 Loose images from the inside of Durham Cottage, photographed by Tom Blau. These had been removed from the album, placed in sleeves, and put back in order. You can see the photo corners still attached to the album pages. Loose snapshots in individual sleeves. I have numbered each photograph on the back with pencil for cataloguing purposes. 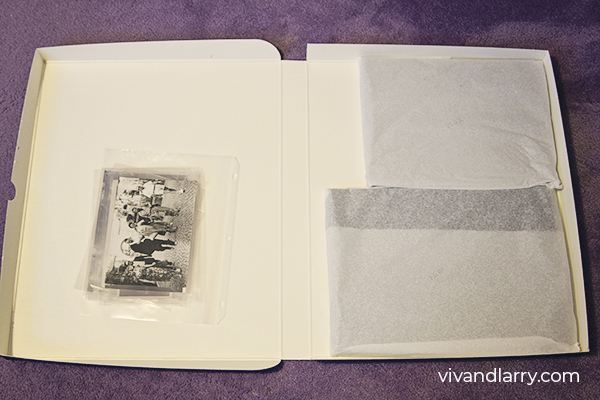 Albums VL01 and VL02 as well as loose photos wrapped in tissue paper and housed in folio box. 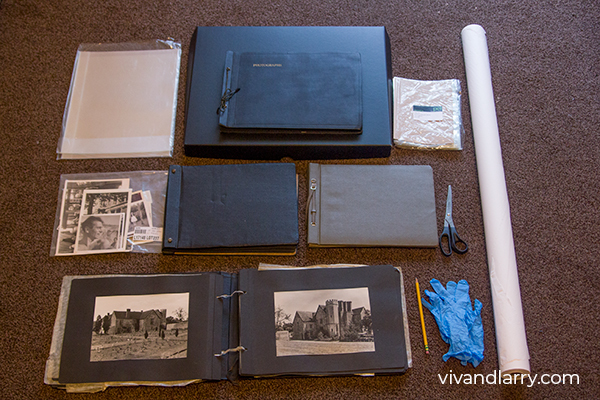 It is important to wear nitrile gloves whilst handling old photographs outside of their sleeves (some archives require cotton gloves, but these can catch on paper and offer less dexterity). The natural oils on our hands can leave fingerprints on the emulsion and permanently damage the images. I’m currently storing the folio boxes in my home office, away from the window. This is not 100% ideal – professional photograph archives are temperature and humidity controlled – but as I don’t live in a museum, it’s fine for now. The important thing is to keep the images in a clean, dark, dry environment at a stable temperature. It’s cold and damp up here in the north of England so I keep the albums well away from the window to avoid mould. Regular vacuuming is also carried out to prevent paper eating pests. In my next progress report I’ll talk a bit about the process I’ve devised to catalogue and digitize the images. If you work in an archive or museum and can offer any further advice, not just for myself but anyone reading this post, please do share in the comments. Thanks, Audrey! Yeah, it’s the chemicals that are used in printing which can lead to issues. It’s important to store things in a mindful way. I’ve got press photos purchase don ebay that are in pretty bad condition. Once the photo starts degrading, there’s no going back. I don’t have any advice, but I would like to offer my encouragement! I interned at a museum for a while, and having worked a bit with old photos and negatives in the archives (as well as coming across images glued into photo albums-urgh!! ), I can really appreciate and respect the work you’re doing here. It sounds to me that you’re treating these images with great care and obvious conservation research. It is so kind of you to share these albums with other Vivien and Laurence fans; I’m happy that they made it into your hands! Best wishes as you work your way through this process! Audrey used the exact words that I was going to use in ‘sterling job Kendra’. It is great that you are making these available. And when you are holding them, to think: Vivien held these! !